affordable personal computers, he launched one of the largest industries of the past decades while still in his early twenties. He remains one of the most inventive and energetic minds in American technology. In 1961 the family moved to Mountain View, California. This area, just south of Palo Alto, California, was becoming a center for electronics. Electronics form the basic elements of devices such as radios, televisions, stereos, and computers. At that time people started to refer to the area as "Silicon Valley." This is because a substance called silicon is used in the manufacturing of electronic parts. As a child, Jobs preferred doing things by himself. He swam competitively, but was not interested in team sports or other group activities. He showed an early interest in electronics and gadgetry. He spent a lot of time working in the garage workshop of a neighbor who worked at Hewlett-Packard, an electronics manufacturer. Jobs also enrolled in the Hewlett-Packard Explorer Club. There he saw engineers demonstrate new products, and he saw his first computer at the age of twelve. He was very impressed, and knew right away that he wanted to work with computers. While in high school Jobs attended lectures at the Hewlett-Packard plant. On one occasion he boldly asked William Hewlett (1931–2001), the president, for some parts he needed to complete a class project. Hewlett was so impressed he gave Jobs the parts, and offered him a summer internship at Hewlett-Packard. After graduating from high school in 1972, Jobs attended Reed College in Portland, Oregon, for two years. He dropped out after one semester to visit India and study eastern religions in the summer of 1974. In 1975 Jobs joined a group known as the Homebrew Computer Club. One member, a technical whiz named Steve Wozniak (1950–), was trying to build a small computer. 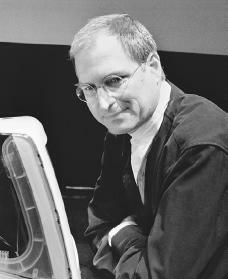 Jobs became fascinated with the marketing potential of such a computer. In 1976 he and Wozniak formed their own company. They called it Apple Computer Company, in memory of a happy summer Jobs had spent picking apples. They raised $1,300 in startup money by selling Jobs's microbus and Wozniak's calculator. At first they sold circuit boards (the boards that hold the internal components of a computer) while they worked on the computer prototype (sample). Jobs and Wozniak redesigned their computer, with the idea of selling it to individual users. The Apple II went to market in 1977, with impressive first year sales of $2.7 million. The company's sales grew to $200 million within three years. This was one of the most phenomenal cases of corporate growth in U.S. history. Jobs and Wozniak had opened an entirely new market—personal computers. Personal computers began an entirely new way of processing information. Jobs continued to be the marketing force behind Apple. Early in 1983 he unveiled the Lisa. It was designed for people possessing minimal computer experience. It did not sell well, however, because it was more expensive than personal computers sold by competitors. Apple's biggest competitor was International Business Machines (IBM). By 1983 it was estimated that Apple had lost half of its market share (part of an industry's sales that a specific company has) to IBM. In 1984 Apple introduced a revolutionary new model, the Macintosh. The on-screen display had small pictures called icons. To use the computer, the user pointed at an icon and clicked a button using a new device called a mouse. This process made the Macintosh very easy to use. The Macintosh did not sell well to businesses, however. It lacked features other personal computers had, such as a corresponding high quality printer. The failure of the Macintosh signaled the beginning of Jobs's downfall at Apple. Jobs resigned in 1985 from the company he had helped found, though he retained his title as chairman of its board of directors. NeXT was not, however, the end of Steve Jobs. In 1986 Jobs purchased a small company called Pixar from filmmaker George Lucas (1944–). Pixar specialized in computer animation. Nine years later Pixar released Toy Story, a huge box office hit. Pixar later went on to make Toy Story 2 and A Bug's Life, which Disney distributed, and Monsters, Inc. All these films have been extremely successful. Monsters, Inc. had the largest opening weekend ticket sales of any animated film in history. In December of 1996 Apple purchased NeXT Software for over $400 million. Jobs returned to Apple as a part-time consultant to the chief executive officer (CEO). The following year, in a surprising event, Apple entered into a partnership with its competitor Microsoft. The two companies, according to the New York Times, "agreed to cooperate on several sales and technology fronts." Over the next six years Apple introduced several new products and marketing strategies. In 1998 Jobs announced the release of the iMac, which featured powerful computing at an affordable price. The iBook was unveiled in July 1999. This is a clam-shaped laptop that is available in bright colors. It includes Apple's AirPort, a computer version of the cordless phone that would allow the user to surf the Internet wirelessly. In January 2000 Jobs unveiled Apple's new Internet strategy. It included a group of Macintosh-only Internet-based applications. Jobs also announced that he was becoming the permanent CEO of Apple. In a February 1996 Time magazine article, Jobs said, "The thing that drives me and my colleagues … is that you see something very compelling to you, and you don't quite know how to get it, but you know, sometimes intuitively, it's within your grasp. And it's worth putting in years of your life to make it come into existence." Jobs has worked hard to translate his ideas into exciting and innovative products for businesses and consumers. He was instrumental in launching the age of the personal computer. Steve Jobs is truly a computer industry visionary. Brashares, Ann. Steve Jobs: Think Different. Brookfield, CT: Twenty-first Century Books, 2001. Butcher, Lee. Accidental Millionaire: The Rise and Fall of Steven Jobs at Apple Computer. New York: Paragon House, 1987. Wilson, Suzan. Steve Jobs: Wizard of Apple Computer. Berkeley Heights, NJ: Enslow, 2001. Young, Jeffrey S. Steve Jobs: The Journey is the Reward. Glenview, IL: Scott, Foresman, 1988. Am realy impressed about the life of commitment to his vision and career. He refused to be discouraged despite the challenges he went through, but stayed dogged to his convictions until he rose back to the top of his career as Apple's CEO. May his soul rest in peace. I realy would want to know his religion and faith before death. Steve jobs is a wonderful man to emulate. He was a great person.God bless him. Really We are loss the more new design of the apple product because of steve jobs died. I could not help noticing that Mr. Jobs was a son of an American Woman and a foreign student of muslim faith from Syria, a post graduate student at University of Wisconsin. There is another great American who is born of American woman and a post graduate student from Kenya, who is now the President of the United States. This was due to our generous immigration policies of 1950's. The structural engineer resposible for the design of John Hancock and Sears Towers came as a foreign student. His name was Fazlur Rehman Khan. I am extremely proud of our great country of USA. He was a great person, God bless him we know that always fought with his disease. Steve Job was a really a person to be idolize. He make things that help today's generation in terms of technology. He is a person that never fails to discover something new or something better. Because of his brilliant mind and ideas the world today made easy. To the greatest person of his time Steve Paul Job - My Salute! Steve jobs you are wonderful and we all respect your efforts in this world. A self made icon has decamped from this world the story about Steve Jobs and his myriad of inventions should pose a challenge to the World of present day scholar's. He never imposed himself to the world but his ingenuity and skill have! its very sad how he died he will be remembered i have a i-Pod and all types of inventions he made to the apple. I will cherish his memory. Steve jobs was really unbelievable person in the history. He was a person that able to translate their thought into in reality. We all will remeber him! and he is a true great man, what would we ever do without technology? !